Hang on to your debit cards, kids, 'cuz I'm still on a jewelry kick from yesterday. And I love these kinds of cuff bracelets: big and dramatic, but adjustable for little hobbit wrists like mine. And yes, the propeller spins. See? FUN. 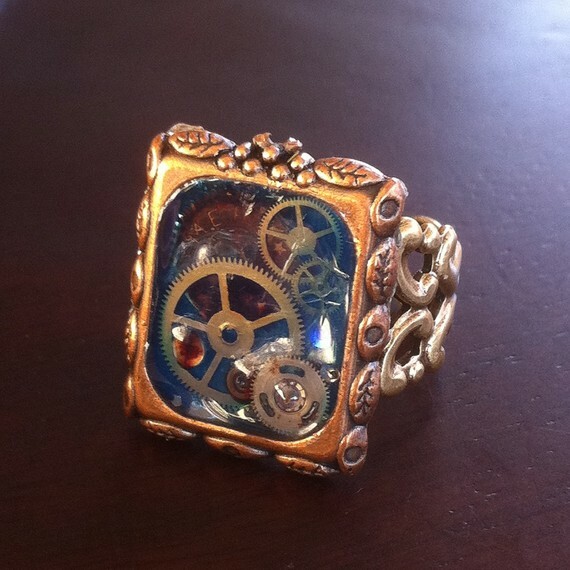 Most steampunk rings you see just have a watch movement glued to a band, so I like how this one has all the extra gears and embellishments - plus the crystal is a cool, unexpected touch. It actually pains me to share this next one with you, because even though my frugal side has been holding out against my "But I WANT it" side, my "WANT it" side is still pretty insistent. So if it's not available anymore, that means my frugal side lost. * Heh. Oooh, you guys, that green! I love it! That little padlock and key just stole my...aw, you know. Submitted by Julie W., DIY Necklace Design found here. This ring pendant is a working sundial. You line up the center band with the correct month, and "light shines on the inner surface of the ring where the times of the day are engraved." Seriously. How cool is that? Only $15, people! 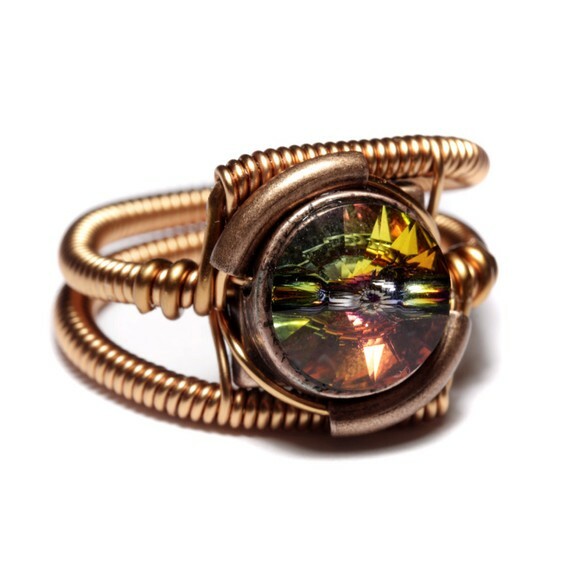 And that's one of the most unique steampunk ring designs I've ever seen. Talk about a great use of resin. The wire wrapping on her designs actually seems a little more cyberpunk to me (or Borg, for that matter [smirk]), but I love it. Check her store for tons of different stones and metal finishes to choose from. I have pieces from both Catherinette and Bellalili. They're gorgeous, and I always get tons of compliments. Both sellers highly recommended! I loved http://www.etsy.com/transaction/45911962 from the last place, but it's been sold! 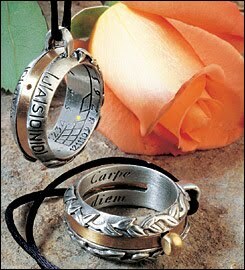 I so want that first bracelet!! I love the tiny gear center so much! The sundial pendant is even geekier than you knew -- it's a reproduction of a sundial that Eleanor of Acquitaine gave to King Henry II in 1152. My mom got one for me a number of years ago and I still love it. These are fabulous! I've just started following your blog and spent hours last night reading back through the archives and getting very inspired. Everything a geeky gamer steamer could need and more! A friend of mine does amazing steampunk (and apparently dreampunk, learned from your blog) inspired stuff. Her photos don't show the breadth of her work yet but try this album of rings - most of the these have parts that rotate, like the butterfly or the stone! She sells out so quick that not very many get to be photographed but I'll send you in better pics once they eventuate. Thanks for making the net a better place! Man, I LOVE when you post jewelry. It's a ready made dose of pretty for when I need it. 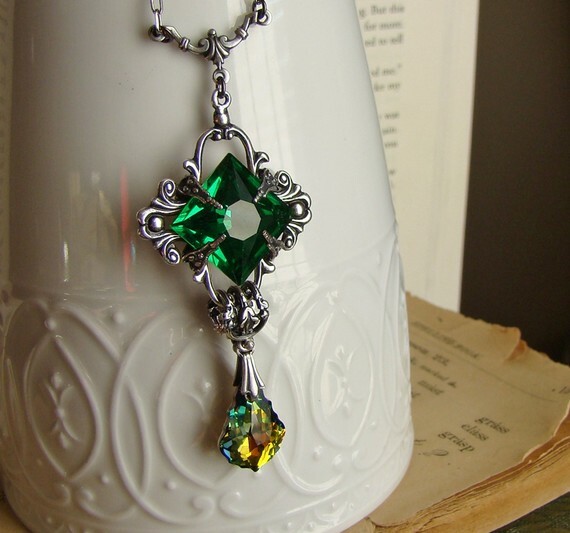 It makes me think up jewelry for my characters to wear that I will never ever describe because I am laaaaaazy. Arrgh, if only I had about a hundred dollars just laying around, waiting to be spent on jewelry. I'd SO be getting that amazing green necklace and the ring at the end. They are all very cool - Looove the bracelet! And I'm not sure if that is OK in the comment section, but I have a handmade Princess Leiah Doll in my etsy shop that I would like to show you! I don't buy things online so it pains me to see all of the cool things you show here on Epbot. I need to make sure my credit card is nowhere near the computer when you post links to sparklies. That green one is so beautiful! 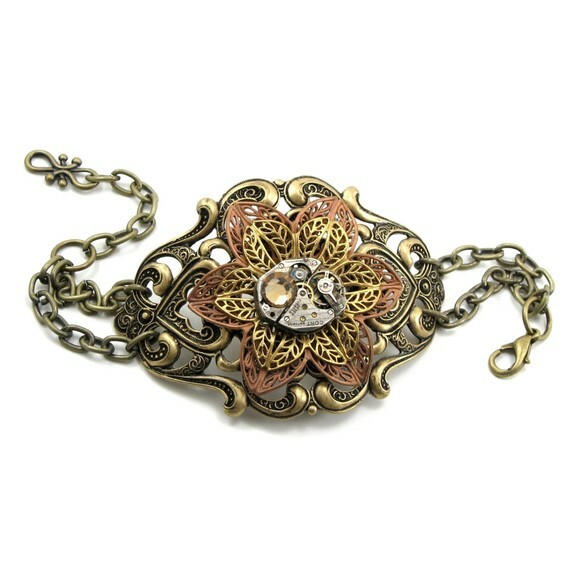 Oh dear Lord, I just went to all of those stores and THEN searched Steampunk Jewelry on ETSY. Mistake!! I'll have one of everything please, thanks!! 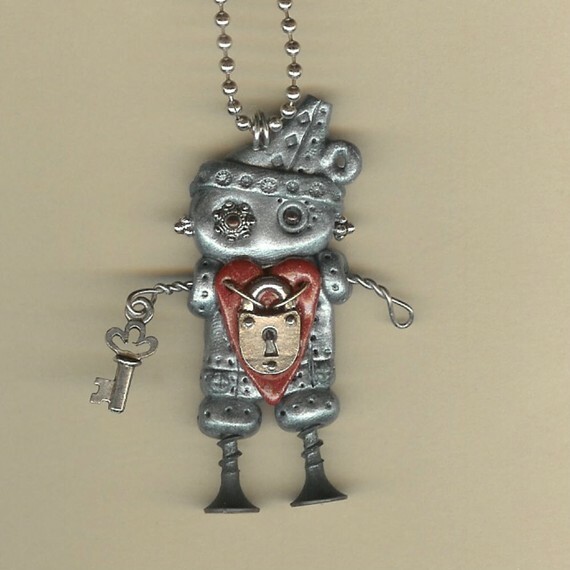 The lockets from BirdznBeez...hmmm, I might just have to get one... maybe this one this one. The Bellalili stuff is really really pretty... when is payday again???? @ Amy - You made me LOL. Enjoy your new ring! @ Joie - Great stuff! You should convince her to put some on Etsy. @ Veelana - Of course it's Ok! Feel free to post a link here in the comments so I can check it out. I think i might literally NEED that one wizard of Oz necklace. SO. ADORABLE. You have hobbit wrists, too? It's so weird. I'm 5'8" and anything but petite, but my wrists are weirdly tiny! I had to have 6 links removed from my last watchband before I could wear it. 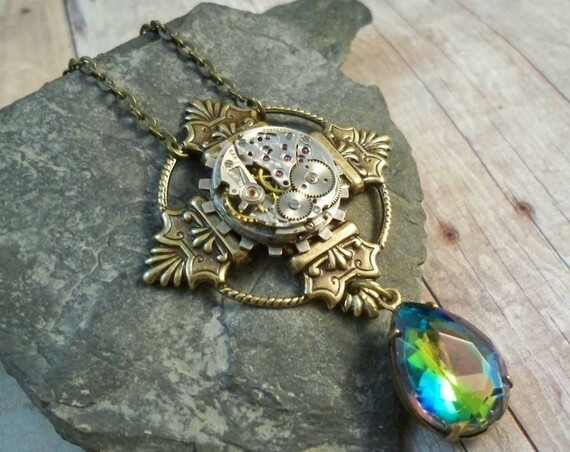 I think what amazes me most about steampunk jewelry is the "smallness" of it. I'm fascinated by things that are small parts that make a whole, such as beadwork, horsehair jewelry, cross stitch, and this kind of stuff. The more tiny gears and teensy pipes, the better! I can just stare at this kind of stuff all day. I also just finished watching Wild Wild West, the movie with Will Smith. I know, it's cheesy and chummy, but for some reason I like it. AND there's some great steampunk stuff in the movie. So for all those steampunk geeks out there, if you haven't checked it out, then you might want to! well, thanks a bunch Skwishee, i followed your link and now i have an acute case of "want one of each, NOW!". and that stuff is costly. but soooo beautiful. and working. and i absolutely need a device that tells me the time at night. and during the day. because, well, my wristwatch doesn't do a good enough job, right? now, what do i do? spend money i need for daily costs like food and stuff on jewelry? I saw it and immediately thought of you. I have a friend who makes some GORGEOUS stuff. Figured you'd like to see! Her steampunk stuff is amazing! Katie - that seahorse is really cool, and I'll bet Jen likes the <a href="http://www.etsy.com/listing/70311494/cigarette-case-large-gold-nautical>cigarette case</a> too! I wonder what other uses a cigarette case could have...??? 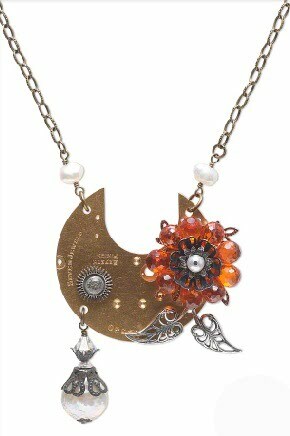 I've had that sundial necklace since high school. It's wonderful. 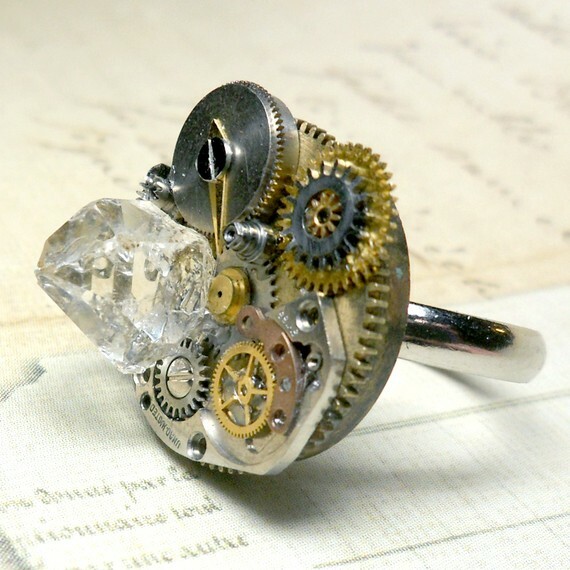 I love all the steampunk stuff, but I can't imagine wearing that crystal ring. It looks like it's the size of a deck of cards. You've probably seen this already, but http://www.inventables.com/ is sort of amazing. I thought you'd like it. Did anyone else suddenly remember the movie "Romancing the Stone"and how much they liked it? The Gentry No. 2 pendant with the big square green stone brought me right back to 1984! Thanks, Epbot! crousha: I hadda crousha on Michael Douglas AND the big square emerald in that movie. I love those grammar earrings, totally added to my want list. (I'd get the semi-colons probably). 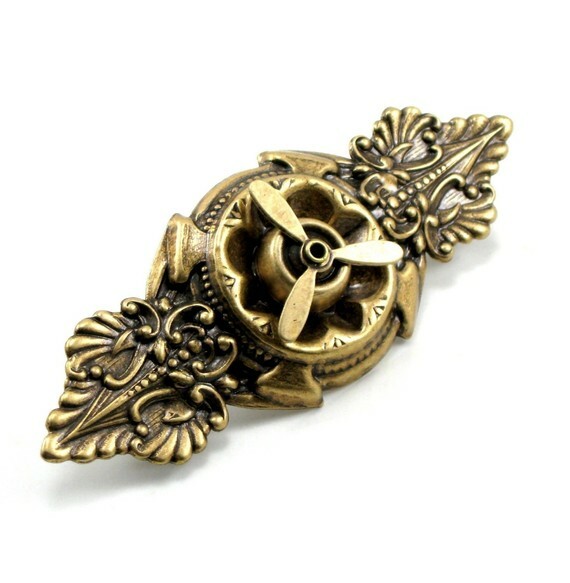 I would like to recommend a Texas artist who has been crafting some steampunk items. Her shop is called StickLizardDesigns and I hope this URL works properly. Here's another propeller ring I found and just might buy! I have freakishly small circus freak hands and I think this one will suit them better! I hear you on the bangles thing; try looking for child-sized bangles. If you find some that fit over your hand, you'll know what size diameter you need and you can ask the bracelet makers if they have/make your size. On the up side, I have a silver cuff bracelet I got at Williamsburg when I was 10 (the jeweler shaped it right in front of me) and it still is one of my favorite bracelets 30+ years later...because it still fits my wrist!